When you walk the aisles of your local Walmart, Target, or Toys R Us, you’ll see rows upon rows of toys. One of my favorite aisles, both as a youngster and as an adult, have been the toy aisles. 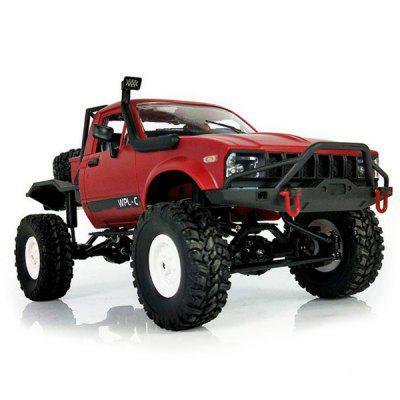 Maybe I’m on the lookout for gifts for my kids, or maybe I’m in the market for a new driver for my 1/10 scale rigs. There are so many fun things to find down these halls, especially in the R/C aisle. Although my personal tastes have led me away from toy-grade radio-controlled cars and trucks, I still make an effort to see what new R/C machines are available for younger enthusiasts. After all, this is how I got my first taste of the hobby, and I’m guessing many of you have as well. Over the years these “toys” have evolved and have taken on some hobby-style attributes. New Bright sent me one of their latest models, the 1/10 Trak Attak, to re-acquaint myself with the entry-level side of radio-control. On the outside, the Trak Attak looks like your typical radio-controlled toy that you’ll find at your local “big box store”, but a closer look reveals small details and assets that are commonly found on “hobby shop” R/C machines. The first item that I noticed were the exposed body posts and body pins that hold a polycarbonate body to the chassis. Having a removable body is a nice touch, making internal access easy and hassle-free. It also gives those with creative minds a quicker path to the inner workings of a vehicle for tinkering and enhancements. Even though the body pins are all plastic, the fact that you can easily remove the body from this vehicle to access the inner-workings is a unique to this level of toy. The second aspect that grabbed my attention was the included 2.4GHz radio/transmitter. While this isn’t something that you can (easily) swap out, it is a refreshing change to not be stuck with one of two radio frequencies, limiting the amount of vehicles that can be driven at the same time. Truth be told, your amount of fun is also limited, especially if you have more than two people who want to enjoy R/C action at the same time. The eye-catching graphic elements don’t stop with the body shell of the Trak Attak. The box itself is attractive and features a great amount of information to let you know what’s inside before you open (or rip) into the packaging. Once you get down to the what’s inside the package, you’ll find everything, from the vehicle to the controller, securely fastened into the cardboard base. While I typically dread waiting for batteries to charge, I was surprised (and quite happy) to find that our battery pack had a decent amount of charge in it, allowing my test drivers to quickly take it outside for a spin. Read my initial impressions of the New Bright Trak Attak. While the removable body shell is one of the largest exterior pieces on this radio-controlled machine, there are some additional elements that lend it visual interest. The first attention-getter may be the large wing at the rear of the vehicle. Because of this, the Trak Attak bears a similar appearance to a bumper car. Maybe that is due to a recent amusement park trip that I was on with my family, but if you squint, you may see what I’m referring to. That said, another comparison that can be made is to a snowmobile. With the eye-catching graphics, track shrouds, and a “ready to pounce” profile, I’m tempted to waterproof the electronics and see what this can do on the snow. Realistically, I probably won’t do this, but the urge has crossed my mind more than once. However I describe the appearance, one thing rings true. It’s attractive. My kids and I took it out for a test drive and almost-instantly had three of their friends from the neighborhood asking questions about it and taking turns behind the wheel. The two motors that power the Trak Attak, along with the durable track that it rides on, give this machine an unexpected level of performance. There isn’t much off-throttle movement from this vehicle either, which allows for quick stops and some very sharp, crisp maneuvers. I have been very impressed in the performance that the Trak Attak offers, especially in off-road, grassy conditions. While it can get bogged down in grass that’s taller than one inch, nine times out of Ten, it is able to gain traction and continue moving. Performance on carpet is equally impressive. The crisp starts and stops are amplified by the rubber track treads, and both I and my children were able to drive the Trak Attak through a minefield of toys and other playtime debris. Powered by dual motors and a 12.8V Lithium Ion battery, this machine powered through indoor and outdoor terrain like a champ. When it has a clear running space, it’s quite quick and features agile handling. The Trak Attak controller is Rather basic, especially if you compare it to other 2.4GHz controllers from the hobby world. That said, the beauty of it lies both in its simplicity, as well as the overall design. The twin-stick controls allow you to drive the Trak Attak forward, backward, and make both wide, sweeping turns as well as sharp, “turn on a dime” maneuvers. While a bit small for adult-sized hands, the size of the controller hasn’t been a negative factor in my use of the vehicle. My children were able to easily figure out the control methods and direct the Trak Attak wherever they wanted it to go. The controls themselves aren’t proportional, so when you press either direction, you’re all-in, full speed ahead (or backwards). Whether or not this is a drawback ultimately rests in the driver’s hands. There were some instances where I would have liked having finer control over the Trak Attak’s speed, especially when lining up for jumps, but I was able to work with the controls and direct the vehicle where it needed to go. Admittedly, the New Bright Trak Attak is geared toward younger R/C enthusiasts and those that are looking for a first (or second), fun radio-controlled vehicle. Having said that, even “older kids” (or kids-at-heart) can have fun with this machine. The durability that New Bright builds into their machines has served both myself (and my kids) quite well. We have a number of older models that have been, and continue to, take beatings and abuse without major issue. From jumps to head-on collisions, rarely do we end up with part failures, even cosmetic damage. Out of the box, my “test drivers” gave me some cringe-worthy moments, driving the Trak Attak straight into furniture and other barriers. We’re talking “just out of the box”, pre-beauty-shot status when “WHAM-O” they went full tilt into an object. Thankfully, there were no ill-effects as a result. Though our testing, this vehicle has been driven hard, kid-hard, and came out looking and running great. There were two instances where parts came off of our Trak Attak. As I was doing some spins and doughnuts on our driveway, the track edge hit the lip of a concrete slab. This resulted in the track being partially ejected. After a quick procedure, I was back to making more not-so-smokey doughnuts and ripping around the yard. On another occasion, the body shell was given an opportunity to demonstrate its flexibility after it was strategically (or maniacally) driven into a barrier. At first glance, I thought there was going to be lasting damage to the polycarbonate body, but after removing the vehicle from where it was wedged, the body sprang back to form and it looked as if it was just taken out of the box. Is the New Bright Trak Attak the Right R/C Machine for You? For some (myself included), making a decision to buy a hobby-grade radio-controlled vehicle can take some time. There is usually a large amount of money at stake and ultimately you’re making an investment in fun. With toy-grade radio-controlled vehicles, there often isn’t a high cost involved, but you’re taking a gamble on the fun that you’ll get in return for your money. Speaking from my own experiences, I’ve had a number of toy R/C machines not live up to the hype that I placed on them, for one reason or another. Some didn’t have enough power, others broke soon after they were driven. No matter what level of radio-control you’re looking at, there are considerations to be made. Focusing on the New Bright Trak Attak, I haven’t found many downsides to it, either in the cost or fun department. It’s quick, nimble, and can travel over a variety of surfaces, which you may be hard-pressed to find in other radio-controlled toys. The hobby-grade assets that it borrows, such as the polycarbonate body and 2.4GHz radio are not needed, but definitely nice to have on this model. Speaking from my own experience, I have had a blast driving this vehicle, with it providing a nice escape from my daily grind. The fact that my kids, as well as their friends, have been having fun with it makes it that much sweeter. The durability that has been built into it gives me a break from issues that have arisen on some of their other, higher-dollar models. With a price of $49.97 (available at Walmart.com and in-store), the Trak Attak won’t break your budget and can provide ample fun for a relatively small cost. For someone who is looking to share the joy that is R/C, this is a unique and viable option.